Lock in a great price for Ban Chang Tong – rated 8.6 by recent guests! Extra friendly staff and they were more than willing to help with extra-accommodations/outside reservations for activities. Authenticity was number one,staff very friendly,rooms very clean, good location across from wat bupparem so awesome! The rooms and courtyard/ pool area were beautiful and very clean. Doors are not soundproof but our stay was still quiet as the other guests were respectful of one another. Very unique hotel in a prime location. Excellent variety for breakfast provided and staff very friendly and helpful. The food at the hotel is great. 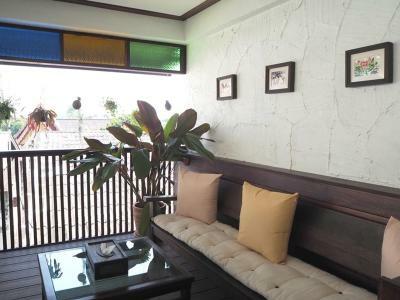 Good location, close to the night market. And The pool is nice and refreshing. The pool and presentation of the hotel room was amazing. Very clean and quiet. Easy to check in and i was able to request a really early check in which was very accommodating for me since i arrived at midnight. I definitely recommend the breakfast, great choices and worth the few extra bucks. I like the ambiance of the hotel. It brought me back to the old Chiang Mai. The room was beautiful and the staff for the most part very friendly. I absolutely loved the bathroom and the furniture. There was a small safe in the room which was nice, and the bed was extremely comfortable (my first soft bed in Chiang Mai). The elephant towels on the bed were such a sweet touch also. Good size room for single or couple. The layout of the place was amazing, with the beautiful pool and hanging plants, felt very special. I loved the overall design and decor of the hotel. Nice beds and A/C worked great. Very central to the night market and right in front of the temple. Staff is friendly and accommodated us with earlier breakfast on a day trip. Also, 15 min away from the airport. Beautiful atmosphere, the wood and plants are wonderful. Very comfortable and cozy beds. The property was very charming. The staff was amazing! Seemed to be a good location & excellent price & it was very clean. 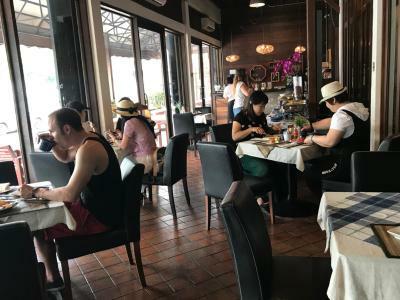 Ban Chang Tong This rating is a reflection of how the property compares to the industry standard when it comes to price, facilities and services available. It's based on a self-evaluation by the property. Use this rating to help choose your stay! One of our top picks in Chiang Mai.Located right beside the famous Thapae Road in Chiang Mai, Ban Chang Tong features an outdoor pool, a restaurant and bar and free WiFi access in all areas. 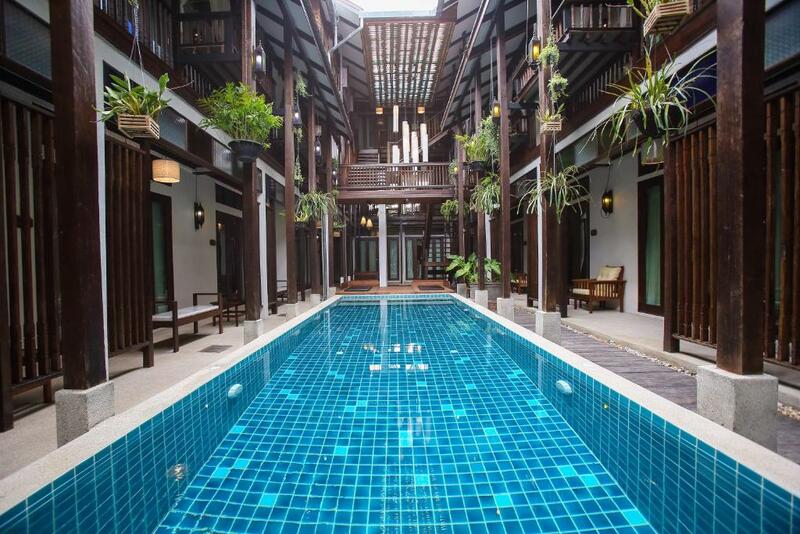 Incorporating traditional Thai designs, the hotel features wooden furnishings and decorations throughout. Furnished with genuine dark wood, all guestrooms are air-conditioned and include a flat-screen cable TV, a refrigerator and complimentary coffee and tea. The private bathroom is fitted with hot/cold shower facilities, towels and free toiletries. Other amenities including a hairdryer, a safety deposit box and slippers are also available. The front desk at Ban Chang Tong is available 24-hour everyday to assist guests with luggage storage, laundry and airport transfer services. For those who would like to explore the ancient city, car hire can also be arranged on-site. The hotel is located within a walking distance to many restaurants serving both Thai and international favorites. 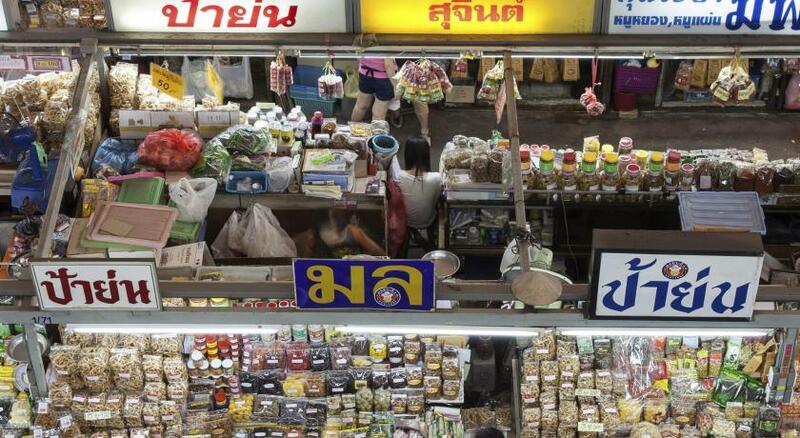 Guests can enjoy shopping and sampling local cuisines at Chiang Mai's famous Warorot Market and Chiang Mai Night Bazaar with just a 5-minute walk. 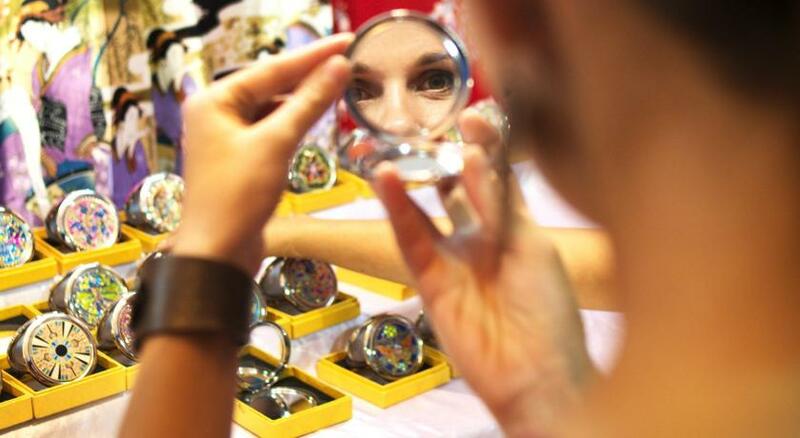 Handmade souvenirs, street performances and local snacks can be found at the must-see Sunday Walking Street, located about 0.9 mi away. Chiang Mai International Airport is 3.1 mi away from the property. 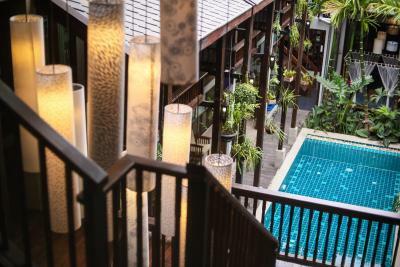 When would you like to stay at Ban Chang Tong? This twin/double room has a patio, a mini-bar and a cable TV. This double room features a tea/coffee maker, an electric kettle and air conditioning. Ban Chang Tong Hotel the 38 Guest rooms decorated with brown colors representing “the nature” concept and a dedicated wood detail. The main theme is a surrounding with pleasure like we are relaxing with our home .The design is a perfect blend between its furniture and main theme. All room is every aspect and tells the story of Thai-northern style. 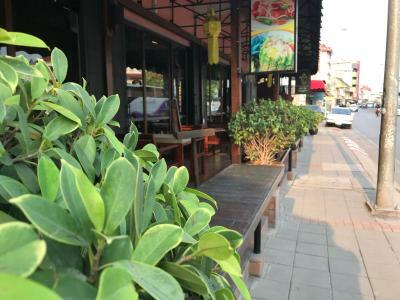 As best alternative , It is situated on the Thapae Road ,Opposite the Thapae Gate and can walk around 5 minutes and easy to walk to the Sunday Walking street or the old town area to visit most famous. House Rules Ban Chang Tong takes special requests – add in the next step! Ban Chang Tong accepts these cards and reserves the right to temporarily hold an amount prior to arrival. Please note that only the Deluxe Double Room can accommodate an extra bed. The large upstairs lounge would benefit with air conditioning. The hotel was a traditional styled property with a lot of character. The staff were friendly and welcoming. The step down shower. I thought it was quite dangerous. The swimming pool was right at my door. The breakfast was average. Very average. The place was clean. As low season the breakfast buffet wasn't on, definitely could mention this when booking. Showers are not suitable for small kids or older people as a large 2 foot drop to get into them and very slipply edges, found that out the first night the hard way. The room service is negligent, we found dust everywhere that was not cleaned daily (corners, above the door, etc.). It is not clear from the pictures, but the rooms on the ground floor open to the corridor with all shared areas - quite creepy. Luckily, the receptionist was nice and we got another room. Yet, if you want privacy, you need to use the curtains, leaving you with a really dark room. The pictures correspond to reality, this is a truly beautiful hotel. The neighborhood is nice, everything is easy to reach. The airport is about 10-15 min away by Grab/taxi. The staff was friendly and helpful. No lift, which might impact on people with mobility issues. Chiang Mai had air pollution problems due to burning off the rice fields, this smog had lasted for several weeks and would impact on people with respiratory problems. Hard to sit by the pool if two people are already there. Shower curtains need to be changed. The staff was extremely nice and polite. They helped us book a day trip throw them, helped us with finding the best cab option and generally interested in offering you the best local tips. The room was cleaned daily and swan towel awaited us to return. Modern architecture with large windows (see through from and to everywhere :) ). Fresh fruit, coffee, tea and water in the room. It was an excellent stay and I have no bad things to say. The room was really noisy. You could hear every step, conversation and movement of the guests in the neighbouring rooms. If you’re looking for a good night sleep, don’t come here. The staff was so kind and went the extra mile to help out and make sure we were having a good time. Location is incredible, just outside the old city, so it’s near all of the locations but still really quite at nights. The pool is really relaxing, but don’t expect to tan. Rooms and bathrooms were beautiful and gave us a spa like sensation. After check out: 1. Fail helping us to call a taxi to airport ... 2. No information for us to call taxi to airport. All, except the one stated in "What didn't you like?" section. On arrival the staff were friendly and helpful. Unfortunately, after paying for a room upgrade I was shown to a lesser room and informed by staff that this was all that is available. Fortunately for me, I had a printout of my booking clearly showing the larger, more expensive, room that I had booked and paid for. I was then shown to the larger room that I had booked. And, strangely, there seemed to be plenty of the larger rooms empty and available. Although not a huge drama, first impressions last and as such my review will include this negative view. The pool, although pretty in the pictures is more or less inside and shaded. There were only two beds by the pool for relaxing. I had a corner room on the ground floor that was quite dark with no natural light. The only mirror is in the bathroom and not convenient for drying hair. 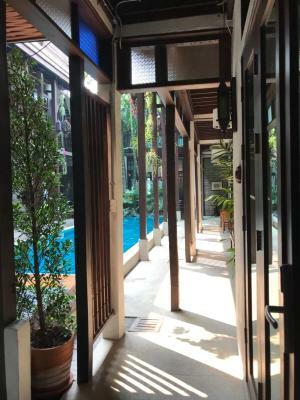 The Ban Chang Ton in Chiang Mai is a nice hotel, conveniently located and within walking distance of the walled city. The breakfast was plentiful and tasty. You have the option of traditional Thai food, cooked eggs and fruit. The hotel has a restaurant integrated which served delicious food and cocktails. It was a great place to meet up with friends. The bed is comfortable and clean. There is a safe in the room and a fridge stocked with water and fresh fruit. Wonderful ambience and old world charm. Staff were friendly and helpful.